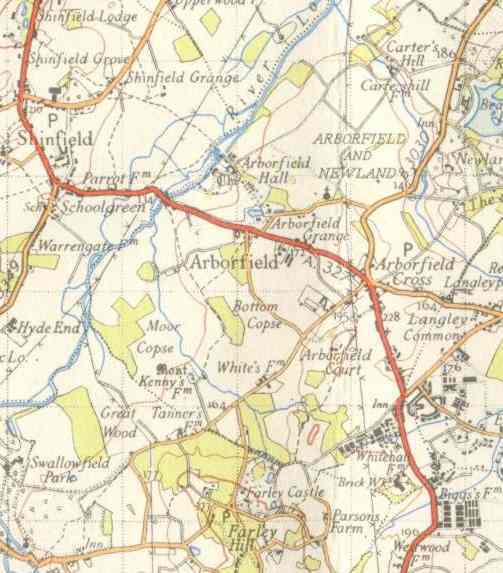 have exercised the minds of the planners over many decades, and Arborfield's problems were being considered even before World War 2. This article looks at some schemes that eventually saw light of day, and many others that didn't. Standard width: The County Surveyor reported that the owners of the ‘Bramshill Hunt’ Public House proposed to rebuild the premises, and before deciding on the site for a new building, had asked for information about road improvements which the Council contemplated carrying out in the future. There is an ‘S’ bend in the road near the present public house, and in 1939 the Ministry of War Transport approved a new 'middle of the road' line in order that the road might be straightened out in the future. The Committee consider that the Council should now adopt a standard width for this proposed improvement based on the new middle of the road line which had already been approved. Recommended: That, in pursuance of Section 1 of the Restriction of Ribbon Development Act, 1935, the Council do adopt a standard width of 80 feet in respect of the section of the Reading – Eversley Road (A.327) from the entrance to Targetts Farm, Arborfield, southwards to a point 110 yards north of the southern boundary of Martaix Farm, Finchampstead, in accordance with a plan prepared by the County Surveyor. Construction of new length of road: - In view of the importance of this road as a traffic route, the Committee considered proposals of the County Surveyor for the improvement of other sections of the road in the future. These proposals included provision being made for (a) the length of new road about 1,266 yards in length to the west of Arborfield Cross, and (b) another section of new road about 2,600 yards in length, commencing at a point near Arborfield Bridge, then northwards and joining the existing road at a point near Ducketts Farm. This proposal would enable traffic to avoid the narrow road through Shinfield Green and the built-up area there. Recommended: (a) That the line of the proposed sections of new road, referred to above, as shown on the plans presented by the County Surveyor, be approved. (b) That the East Berkshire Regional Planning Committee be asked to make provision in their Town and Country Planning Scheme for reserving the land which should be required for the sections of new road; that pending the carrying out of the road-works the Interim Development Authority be requested to refuse permission to develop on the site of the proposed sections of new road, on the understanding that any claims for compensation would be dealt with and settled by the County Council. 18 Shinfield. A by-pass of the Reading – Eversley Road (A.327) commencing at a point north of the “Black Boy” Public House, proceeding in a south-westerly direction to rejoin the Reading – Arborfield Road (A.329 [sic]) at or near the River Loddon. This by-pass is necessary to avoid a narrow and winding road through the village of Shinfield to by-pass the junction at School Green. 19 Arborfield. A by-pass of the Reading – Eversley Road (A327) commencing at a point west of Arborfield Cross to rejoin it at a point to the south thereof. This is necessary in order to avoid development at Arborfield. 20 Eversley: A by-pass of the Reading – Eversley Road (A.327) commencing at a point to the north of the village and crossing the County boundary to rejoin that road in Hampshire. (i) A by-pass to the north of the town commencing at a point on the Forest Road, crossing the A321, proceeding eastwards to join the road A.329, west of Popeswood. (ii) A by-pass to the south of the town by improving the route from Winnersh Cross-Roads via King Street – Bearwood Road and Evendons Lane with a short section of new road to connect with road A.321 at or near “The Throat”. London to South Wales Motor Road – This road will commence from Maidenhead by-pass at a point west of road A.330 and proceed in a south-westerly direction along a line which has not yet been definitely fixed, running north of Wokingham, crossing A.321 in the parish of St. Nicholas, Hurst, A.329 in the parish of Winnersh, A.327 in the parish of Shinfield, A.33 in the parish of Swallowfield, crossing the Great Western railway line at Grazeley, through Burghfield, leaving the county at Mortimer and re-entering the County in the parish of Aldermaston, thereafter proceeding in a line generally westwards, south of Wasing and Brimpton, leaving the County south of Brimpton, then proceeding south of Crookham, Greenham Common, Newbury, cross A.34, A.343, running south of Hamstead Marshall, Kintbury, north of Inkpen, crossing the road A.333 Hungerford – Salisbury Road and leaving the County south of Hungerford. 31 Winchester – Preston Road (A.34). [The suggested route is close to the current line of the A34]. 32 London – Bristol Road (A.4). [By-passes were described for the following towns: Maidenhead, Theale, Thatcham, Newbury and Hungerford.]. 33 Maidenhead – Oxford Road. [There was a tentative proposal for a new bridge north of Henley, to reconnect with the A423 at the top of White Hill]. Over the years, more pressing problems occupied central Government, and the Maidenhead By-Pass didn't get completed until 1959. Just as the population learned to 'make do and mend', so the local authorities had to wait years for any major improvements to their roads, by which time housing development had made several of the schemes listed above impractical. For many years, the A327 didn't even get a footpath along the Reading Road to the north of the Cross, or the Eversley Road to the south, despite continued pleas from Arborfield and Newland Parish Council. A fatal accident in early 1950 strengthened demands for a footpath, but the most immediate result was that the southbound bus-stop was moved to the Post Office where it has remained. The by-pass for Arborfield Cross was later abandoned after it was realised that significant traffic flows were heading east of Arborfield to and from the Motorway junction at Winnersh. However, Ministry of Defence plans for the Garrison meant that the old Poperinghe Barracks could be replaced, allowing a new Garrison by-pass to be built to the west of the 'Bramshill Hunt' P.H. The pub still stands on its original site, though now heavily extended. The width of the road at this point is still nowhere near 80 feet across!